Tamar's instrument of seduction in the Hebrew Bible, Penelope's shroud in Homer's Odyssey, accessory of brides as well as widows, and hallmark of the religious and the wealthy, the veil has historically been an intriguing signifier. Initially donned in France for liturgical purposes and later for masked balls and as a sun- and windscreen at the seashore, face-covering veils were adopted for fashionable urban use during the reign of Napoleon III. In Sheer Presence, Marni Reva Kessler demonstrates how this ubiquitous garment and its visual representations knot together many of the precepts of Parisian life. 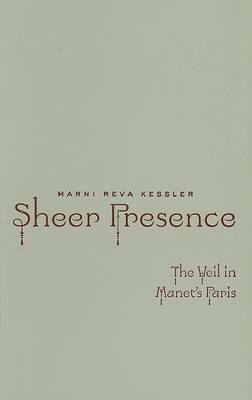 Considering the period from the beginning of Napoleon III's rule in 1852 to 1889, when the Paris Universal Exhibition displayed veiled North African Muslims and other indigenous colonial peoples, Kessler deftly connects the increased presence of the veil on the streets and on canvas to Haussmann's massive renovation of Paris. The fashion of veil wearing, she argues, was imbricated with broader concerns: fears of dust and disease fueled by Haussmannization and class mixing on the city streets, changes in ideals of youth and beauty, attempts to increase popular support for imperialism, and the development of modernist art practices. A veil was protection for the proper woman from the vices associated with the modern city, preserving-at least on the surface-her femininity and class superiority. Kessler explores these themes with close readings of paintings by Gustave Caillebotte, Edgar Degas, and Edouard Manet-including Manet's perplexing portraits of artist Berthe Morisot-as well as photographs, images from the popular press, engravings, lithographs, and academic paintings. She also mines French fashion journals, etiquette books, novels, and medical publications for clues to the veil's complex meanings during the period.Positioning the veil directly at the intersection of feminist, formalist, and social art history, Kessler offers a fresh perspective on period discourses of public health, seduction and sexuality, colonial stereotypes, and, ultimately, an emerging modernity.Marni Reva Kessler is assistant professor of art history at the University of Kansas.